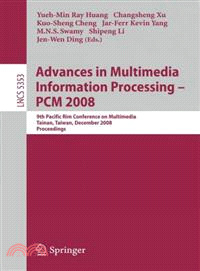 This book constitutes the refereed proceedings of the 9th Pacific Rim Conference on Multimedia, PCM 2008, held in Tainan, Taiwan, in December 2008. The 79 revised full papers and 39 revised poster presented were carefully reviewed and selected from 210 submissions. The papers are organized in topical sections on next generation video coding techniques, audio processing and classification, interactive multimedia systems, advances in H.264/AVC, multimedia networking techniques, advanced image processing techniques, video analysis and its applications, image detection and classification, visual and spatial analyses, multimedia human computer interfaces, multimedia security and DRM, advanced image and video processing, multimedia database and retrieval, multimedia management and authoring, multimedia personalization, multimedia for e-learning, multimedia networking techniques, multimedia systems and applications, advanced multimedia techniques, as well as multimedia processing and analyses.